An alliance of European employers is calling on HR and occupational health (OH) professionals to push mental health, and depression in particular, further up the corporate agenda. Sarah Silcox investigates why this is necessary. The “Target Depression in the Workplace” initiative, run by the HR Leadership Forum, brings together some of the largest businesses in Europe. 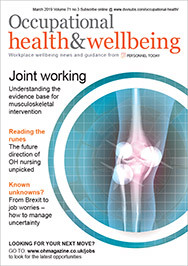 Occupational Health spoke to three of them – Barclays, Deutsche Post DHL and Ogilvy & Mather – about reducing stigma, changing culture and the best ways to give line managers the confidence to support individuals with mental health problems. Depression, along with stress and anxiety, is a major contributor to long-term sickness absence in the UK, affecting the lives of significant numbers of employees, their families and the organisations in which they work. A group of big-name European employers has formed an alliance to target depression in the workplace, and has recently published a report as an early first step in its campaign, setting out why employers must act, the challenges they face and the steps they can take to reduce the workplace impact of this serious condition (HR Leadership Forum, 2014). Depression accounts for 7.2% of the overall disease burden in Europe, affecting 30 million EU citizens at any one time, according to an analysis published on PLOS One in March 2014 (Evans-Lacko and Knapp, 2014). The alliance’s report points out that people with depression lose an average 5.6 more hours a week of productive time than those without the condition. A joint study by the London School of Economics and King’s College London quoted in the “Depression in the workplace in Europe” report estimates that depression costs European business £77 billion a year. This loss in productivity is, by far, the greatest contributor to the overall economic impact of depression and the evidence for an association between depression and impaired work performance is strong. During an episode, workers with depression experience a range of cognitive symptoms, including trouble concentrating, indecisiveness or forgetfulness for up to 94% of the time. However, many line managers believe that employees with mental ill health, including depression, are able to carry on working as normal and that their organisation’s mental wellbeing policies and practices are primarily designed to help the employer avoid litigation, the PLOS One study suggests. An organisation’s workplace culture and environment strongly influences whether an employee with depression decides to disclose their illness. The support and openness of managers, and, in particular, their willingness to talk about the issues around working with an ongoing condition, such as depression, are crucial in enabling a person to stay in work, and also in building a social acceptance of the illness. Organisational culture underpins German company Deutsche Post DHL’s (DPDHL) approach to depression at work. DPDHL launched a corporate guiding principle, “Respect and Results”, in 2008: “This means we are always striving for good results, but in ways that show respect for the individual,” according to Andreas Tautz, chief medical officer at the company. The launch of the principle was an important milestone for DPDHL, acting as a starting point for a range of initiatives around building a culture that supports mental health. Health-promoting workplace design – favourable workplace set-up, working conditions, working hours and working atmosphere. Qualification/development of decision-making competence – foster capability to take responsibility and improve stress resilience. Individual health promotion – support a healthy lifestyle. Respectful company culture and social interaction – open, transparent communication; culture of respectful feedback; creation of social networks; and sympathetic interaction. Its health strategy is guided by one main principle: “Respect and Results”. DPDHL manages mental wellbeing at four levels, one of which is described as “respectful culture and social interaction”. Employment is good for health, and the company uses this inherent advantage to promote healthy working environments: “Once we’ve focused on this we can then move on to look at developing a health-promoting company culture by focusing on relationships between executives and employees, and strengthening relationships in teams,” Tautz adds. The role of DPDHL’s OH team of 70 physicians is: to identify therapeutic needs through referrals; work, if appropriate, with external specialists to provide immediate help with acute needs; and develop rehabilitation plans for those returning to work after time off due to mental ill health. Barclays launched a “This is Me” campaign in May 2014 as the central plank of a year-long initiative on mental health at work. “This is Me” was born out of the financial services company’s recognition that depression and other manageable mental health conditions are major issues in its broader mental health agenda. “We’re starting by tackling stigma – often when someone calls in sick with a mental health issue they tend to mask it with a physical illness,” says Mark McLane, head of global diversity and inclusion at Barclays. “This is Me” attempts to bring the conversation around mental health into the workplace, giving all staff (including line managers) the resources to tackle the issue. It also helps managers and employees to understand depression better, for example, describing how the condition can arise at different points in an individual’s life, or how it can be something that they manage on an ongoing basis. Barclays’ mental health initiative is based around an online portal, open to all employees, which provides access to a set of resources from external organisations specialising in mental health. It also, crucially, gives access to a community of employees with an interest in a particular area, enabling employees with a question to pitch it to an appropriate colleague with relevant experience. Often, colleagues are able to help each other by signposting additional wellness resources. McLane thinks this is a “brilliant” approach as it solidifies Barclays’ expectation that the stigma still attached to mental ill health will fall, “but it also empowers colleagues to support each other on depression and other mental health issues”. The community aspect of “This is Me” does a great job, and it brings all Barclays’ other HR policies on tackling stigma and supporting people with mental ill health “to life”, he believes. Line managers are already using the online community to assist them in supporting people in their teams with depression, according to McLane. An average of 36 working days are lost per episode of depression, with the highest average occurring in Great Britain (44 days per episode, on average). The highest rates of depression diagnoses were in Great Britain and the lowest in Italy. Only 20% of employees in France would tell their employer if they were diagnosed with depression, compared with the average of 34%. Nearly one in three managers reported they had no formal support or resources to deal with employees disclosing depression. Among those managers who stated that they were supported, support from a medical professional was the most frequently cited source (43% of those with any support), followed by support from an HR department (30%). Awareness of the cognitive symptoms of depression is poor – relatively low proportions of participants were able to identify forgetfulness and indecisiveness as symptoms. Boosting the confidence and capability of line managers to support team members with depression is challenging, but also crucial to an organisation’s success in reducing stigma around the issue and fostering acceptance. All the organisations we spoke to recognise this, and have introduced training and professional development modules covering mental health. This management training covers areas such as initiating sensitive conversations, managing confidentiality and making effective referrals to specialists, including OH. Advertising and media company Ogilvy & Mather, approaches workplace depression as part of a wider mental health strategy. 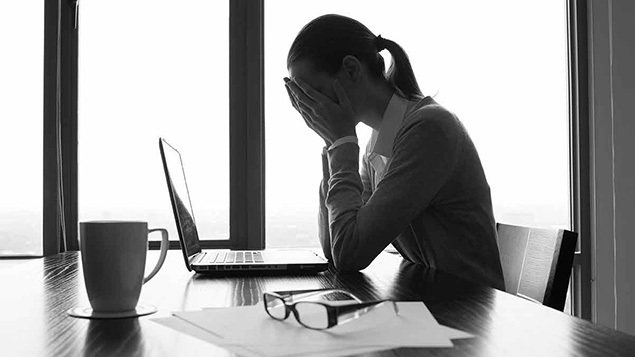 Julia Ingall, the company’s talent management director for the UK division of EAME, believes that there is insufficient understanding of depression in the workplace, particularly among line managers, who often find themselves in a difficult position. “They may not understand what constitutes ‘depression’, or that it can include work-related aspects, such as a loss of concentration or change in behaviour towards colleagues. This can be quite scary for managers,” she suggests. Ogilvy & Mather is working with consultant, Robertson Cooper, to deliver resilience training across the organisation, starting with its leadership level by building it into existing management programmes. “The lines are blurred between work and home, often driven by technology, and I worry that people do not get a break,” Ingall says. Putting the training in place will help managers understand their own resilience levels, how to build on their personal strengths in addition to acknowledging weaker areas. An assessment tool developed by Robertson Cooper, called i-resilience, has been introduced. It will eventually produce data that can be interpreted to develop action plans for individuals. “We’ve also selected eight key HR people to undertake some ‘train the trainer’ programmes so they can understand the issues and roll these programmes out,” Ingall adds. DPDHL provides managers with evidence and data on the value of managing mental health, explaining how their behaviour influences employees and suggesting ways to minimise the impact of damaging behaviour and maximise the positive. The company provides e-learning resources for managers on leading on mental health issues, developed in conjunction with a German university and the Ministry of Labour. “We also started a programme of workshops for managers on preventing depression and burnout in 2012, designed to boost their confidence in handling these issues,” Tautz explains. The workshops operate alongside other HR training activities and professional development plans. “The latest development is a new training programme for senior managers covering mental health at work,” he adds. Involving employees in developing initiatives on depression in the workplace is a feature common to employers in the Target forum. DPDHL established health working circles in each branch in 1997, including representatives from Works Councils, OH physicians and health and safety experts. “These circles explore how and where to address different health topics, including many linked to mental health, such as conflict management, burnout and stress,” Tautz notes. Ogilvy & Mather is in the process of setting up a wellbeing forum to work through issues affecting employee wellbeing: “The job of the forum will be to gather feedback from local offices. We’ve also used leadership groups to explore six pillars of wellbeing, including the impact of client demands and our leaders’ clarity of vision, on employee health,” Ingall adds. One of the “really interesting” aspects of Barclays’ “This is Me” campaign is that it is colleague driven, using the company’s established employee network, Reach, according to McLane. A self-selecting network of around 700 people with an interest in disability, Reach also incorporates listening groups, which are formal focus groups of employees who have self-identified as having a disability, including ongoing mental health issues. Barclays’ “This is Me” is currently a UK-based initiative, but the company plans to roll it out to the bank’s operations in the Americas and Africa during 2014: “This expansion will be one of the campaign’s success metrics,” McLane explains. “We will also look at activity levels within the community and, later on, will invite people to tell their stories around the support it provides,” he adds. HR Leadership Forum to Target Depression in the Workplace (2014). “Depression in the workplace in Europe: a report featuring new insights from business leaders”. Evans-Lacko S and Knapp M, PLOS (2014). “Importance of social and cultural factors for attitudes, disclosure and time off work for depression: findings from a seven country European study on depression in the workplace”.